Today I will be demonstrating the use of WordPress in class web page creation. WordPress is useful for both teachers and students in the creation of webpages for classroom use. Al Markham will also share some information about Dropbox for us. 5. Build some toys for Daniel’s birthday – awaiting various parts in the mail. Wish me luck! I’ve been getting better at “just doing it” so hopefully these things will get done some time in the near future. 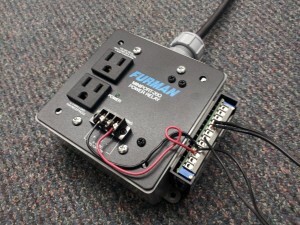 The Furman Miniport 20-Q mounted in electrical box with ACR2 attached to the side. The school I work at has a permanently installed audio system in the gymnasium/auditorium. I am responsible for the upkeep and use of this system, and over the years I have attempted to streamline the system so it would be easy to allow other users of the facility to use this system. To that end I have been searching for a way to automate the use of the audio equipment. I would love to be able to hand over a wireless mic or a patch cord and have presentations or music playing. 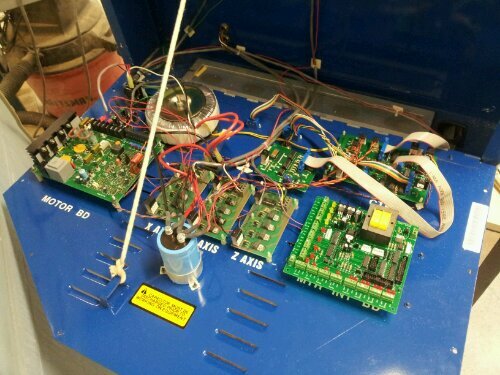 I have started this process by automating the switching on and off of the power amps. To do this I purchased two items: a Furman Miniport-20Q Power Relay and an ST-ACR2 Audio Controlled relay. Unfortunately the Miniport and the ACR require different voltages to operate (24 volts for the ACR2 and 5-18 for the Miniport). I happened to have a couple extra wall-warts to run the unit, but ideally it would have been a single transformer with dual voltages. The Miniport might have been ok with 24v instead of 18v, but I didn’t want to chance burning it out. Next step will be to install this unit in my audio rack and running a patch from my aux-out or even headphone jack. The nice thing about the ACR2 is that I can adjust the input sensitivity and the delay time up to 50 seconds – so if there are lulls in the audio input my amps won’t be constantly power cycling. 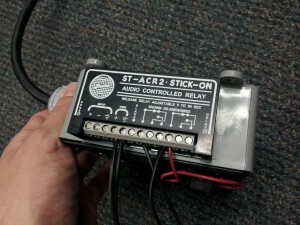 ST-ARC2 with power and relay wiring. So I have figured out that the “encoder count” refers to the length of pulse that is being sent to the stepper drivers – some boards need longer pulse lengths. Changing the encoder count for my setup has no noticable effect on the operation of the mill, so I am not too concerned with the setting. What does have me stymied at the moment is my Z axis – I have tuned the motor, and manual movements are fine and accurate. As soon as I run a program, the Z axis seems to be moving more than it should – it is plunging too deeply into the material. I don’t think that this has anything to do with tuning, so I will have to explore the Mach 3 menus to figure out exactly what’s happening. In other exciting CNC news, I am working on getting my Mastercam X install up and running – this should really increase the capability of our machines. Peeling off the end label of the stepper motor revealed this information. Now that I have Mach3 controlling the D&M 6, I need to fine tune the settings so the movements are accurate. This is done through a tuning process that involves measuring the TPI (threads per inch) of the lead screws in the mill as well as knowing the characteristics of the stepper motors. 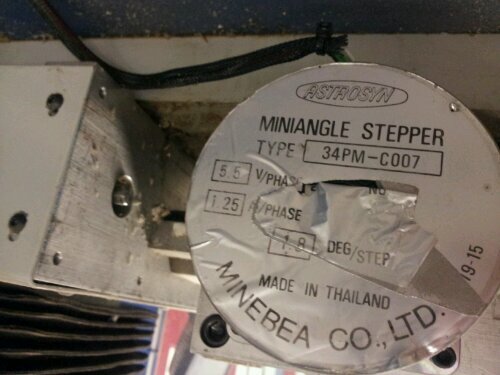 This mill uses Astrosyn Miniangle Steppers type 34PM-C007. The crucial bit of information I learned was that this is a 1.8 deg/step motor – in other words it takes 200 pulses to make a full revolution (360/1.8=200). What I still haven’t completely figured out is the “encoder count” of my motor drivers – if I’m understanding correctly this is the number of encoder pulses that equals a step (correct me if I’m wrong). I’m firmly into guessing territory here. Vinyl cutter project is on hold. 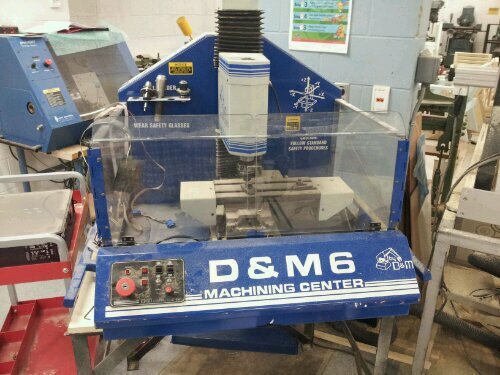 I am currently working on resurrecting this D&M 6 Milling Machine. The original PC controller is long gone, so I have purchased the “Breakout Board Plus” from Bob Campbell and I’m working on getting the PC running Mach3 to talk with the D&M Machine. The new board is installed, so hopefully today I will get some movement out of this machine! 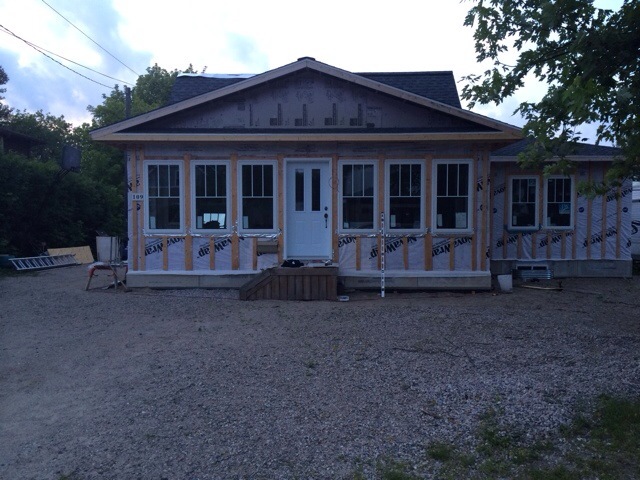 We’re hoping to start machining some aluminum or mild steel on this machine. We are running V-Carve software so we likely won’t be doing much precision machining, more decorative type work. Does anybody out there have any experience with this particular machine? Drop a comment if you have successfully modernized this particular mill. In the background you can see the Spectralight lathe – that’s next on the agenda. The lower right board is the Campbell breakout board in position. 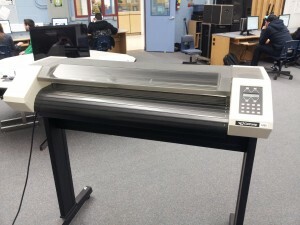 The plan is to get this ancient plotter communicating with a computer and eventually cutting vinyl stickers. Step one is to make a cable and establish communication. I believe that this is an RS-232 plotter. I have a few cables but haven’t taken the time to fight with the settings to make it work. I will also have to bite the bullet and buy some supplies – a knife holder and some software to run this thing. As you may have heard from other photogs, the lens you use on a camera has much more to do with the quality of image than the camera body itself. For the average user any entry-level SLR will meet their needs comfortably. As you move up the ladder to the higher end models you are essentially gaining things like focus zones (the number of autofocus “points”), burst mode shooting (take more pictures quickly), advanced customization (i.e. ability to program what buttons do), faster response times and more recently different video-shooting capability. opinion, the single biggest thing that can improve the quality of your photographs. Fast lenses let you take pictures without using the on-camera flash, so you end up with more natural looking photographs. Fast lenses also allow for shallow “depth of field” which in a nutshell is what you are seeing when you look at a photo with a sharp subject and a “blurry” background. Lens speed is determined by maximum aperture, which is expressed in an f-number such as f2.8, f3.5 etc (the lower the number, the wider the aperture and the more light coming through the lens). Combine natural light with shallow depth of field and you get pictures that most people think look “professional” without even knowing why. There is a catch, of course – faster lenses require better glass and thus need to be manufactured to closer tolerances and are thus (relatively) hellishly expensive – with some notable exceptions. As an example, my main lens at the moment is this this Canon EF-S 17-55 -a fast wide angle zoom lens. This takes nice photos in virtually all lighting conditions. The fast lens that I have my students use is this Canon EF 50mm 1.8 – an even faster fixed length but very cheap lens. As you can see there is a huge price difference – again, this comes down to build quality and materials (metal vs. plastic). I’m not suggesting that you run out and spend $1000+ on a camera lens (of course, if that’s what you want to do, go for it!) but I think it is important to know that SLR cameras shouldn’t be considered a “magic bullet” of good photography, especially in their typical out of the box form. If anything, I’d strongly recommend something like the 50mm lens I linked above, or even a fast off-brand zoom such as a Sigma 17-70mm f/2.8-4 – however even this lens is still going to run you around 500 bucks. You are leaning towards an SLR, but I will caution you that many people underestimate the added bulk that these cameras present both physically and visually. With an SLR taking pictures tends to become more of an event – you can’t just slip it into your jacket pocket and pull it out at a moments notice. With a larger camera you end up carrying another bag that’s buckled and zipped up – and “should we take the camera” becomes a question that you’ll consider every time. There are some really nice point and shoot cameras on the market these days – they are increasingly coming with fast, high quality lenses and take very nice pictures. The general drawback to point and shoot cameras is that their smaller sensor size hinders the ability to get shallow depth of field in your photos (for complex physics-y reasons that I don’t fully comprehend) but that hasn’t been much of a problem for us thus far. At this point I don’t even keep an SLR in the house - it’s at school as that’s where I use it the most. 99% of our pictures are taken with Lindsey’s Powershot. This Powershot looks to be a very nice point and shoot camera, for example. Don’t let me steer you away from going for a full blown SLR – they do take great pics even without aftermarket lenses, but they do have limitations which I hope I have outlined clearly above. Hope it helps, and if the above leads to any more specific questions feel free to leave them in the comments. A friend presented his laptop with a “Just-In-Time Debugger” window that wouldn’t go away. Ran the usual anti-malware apps to no avail. What I found was that the drwtsn32.exe file was missing from the system32 folder. I found a drwtsn32.exe file on another unaffected machine, copied it into the system 32 folder on the laptop and rebooted. Success! The Just In Time popup has disappeared. Hope this helps somebody else doing battle with the Just-In-Time Debugger.